Home » Featured » How to Backup Everything on Windows using Todo Backup? In this era of internet, backing up your sensitive data is always a priority so that we do not lose our important pictures, videos, files, contacts and more! While there are good Free Cloud Storage Options available, there’s not much good software to do the job hassle free. 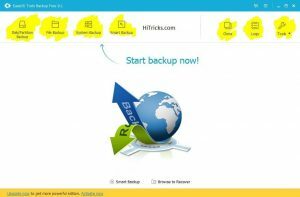 The EaseUS Todo Backup is the Best Backup Software for Windows is an essential must-have software for everyone who wants to get a complete auto-backup solution. Different Types of Backup Options Available including System Backup, Disk Imaging, File Backup, etc. Various types of Restore Options Available including System Restore, Flexible Disk Restore, Selective File Restore, System Migration, etc. Easy Backup Management with Backup Compression, Splitting, Encryptions and Log Reporting. Migrations and Disk Cloning are just a tap away. 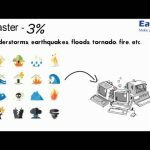 Ready to Explore the EaseUS Todo Backup? 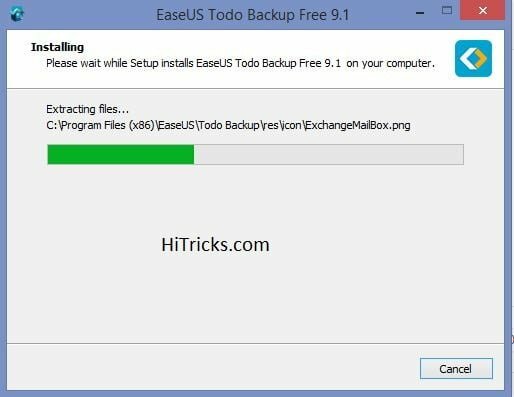 How to Backup Files on Windows using EaseUS Todo Backup? First, you need to Download the EaseUS Todo Backup Software. You can easily download it from EaseUS Website. Click on the Free Download Button. You will be redirected to the download page. 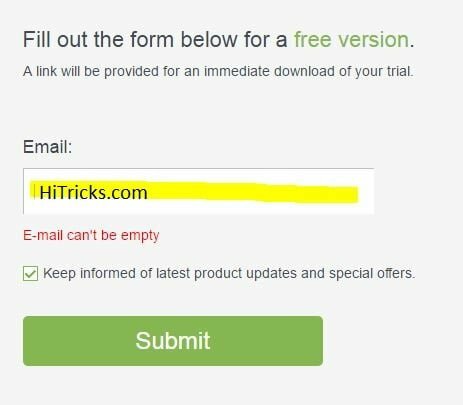 Click on the download button. You shall see a popup asking you to provide your email id. Enter your email there and click Submit button to get the download link. Start Downloading. The memory of the file is around 115MB. After it finishes downloading, proceed to install the software. Just go through the regular installation procedure, including accepting the license agreement, choosing a location for installing, etc. After it finishes installing, click Finish to exit Setup and launch the software. At first, it will ask you to Activate the software using the License Code. Since we need the Free Version only, simply ignore it. Click on Later. Now you will come to the main screen of the EaseUS Todo Backup Software. You shall see different Backup options in the top like Disk/Partition Backup, File Backup, System Backup, Smart Backup. 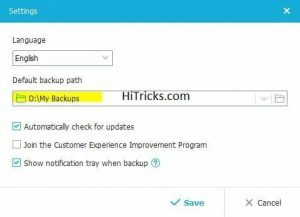 Before backing up, you need to set up a backup location so that you can access your backups easily. Your default backup location will be Drive/My Backups, but you can easily change it to any place you prefer. If you have an external hard disk, you can keep your backups there easily. To set up your backup location, click on the small icon at the top in between the Cart Icon and the Minimize Icon. Another small menu will appear, click Settings. A Popup Dialog Box will appear. You can see the Default Backup Path there and also set up a different backup location from there. The Disk / Partition Backup is a powerful tool for backing up an entire hard drive altogether. To start the Backup, Click on the Disk / Partition Backup Button. Now you will be asked to choose the drive to be backed up and also allow you to configure some additional settings. After you select the backup location, click on the Backup Options Button to set up some additional configurations. 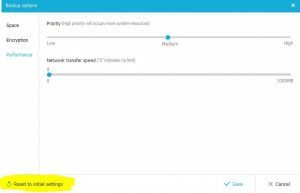 Here, you can find three settings: Space, Encryption, and Performance. The Space Settings will allow you to split the Backup Files, keeping each file of a preset size. Say your total backup size is 20GB, and you need to split it into 20 files of 1GB each. You can easily do that from here. Just click on the Manual Button and choose your desired size from the Dropdown. If you want to set up a custom size, just type the number there in Megabytes (MB) unit. 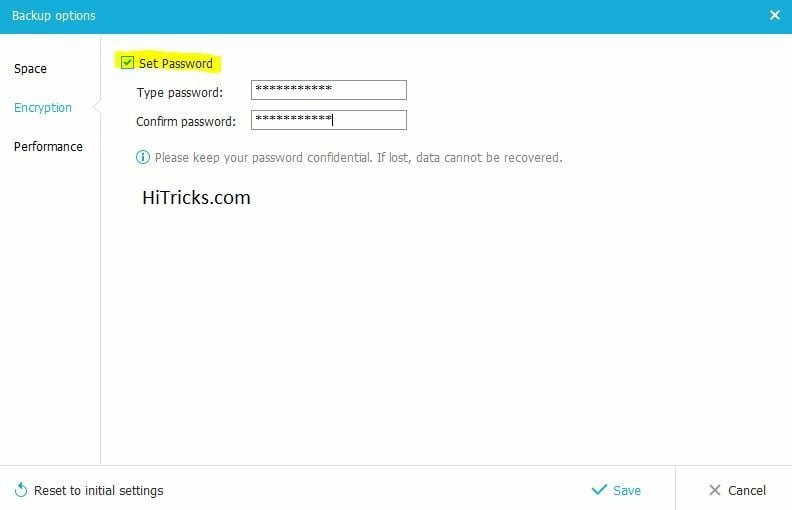 The Encryption Menu allows you to set up a password for your backup. These are very useful if your backup contains your personal photos or files which you don’t want others to get access. Just click on the Set Password Button and you are ready to go. 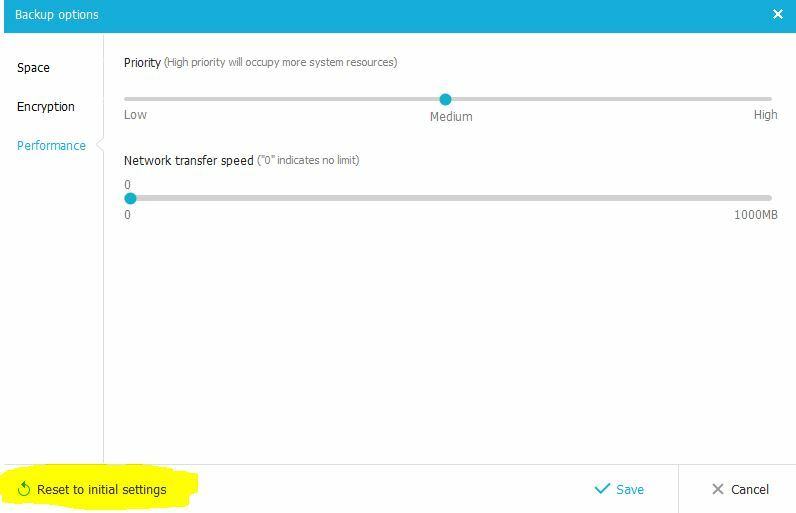 In the performance option, you can set the Priority of your backup and the Network Transfer Speeds. Note that High Priority will occupy more space. Also, setting zero in network transfer speeds indicates No Limits. Click on the Save Button at the bottom right to save your settings. Don’t want the changes you just did? No worries. You can quickly return to the default settings. Just click on the Reset to Initial Settings Button at the bottom and all your custom changes will be wiped. 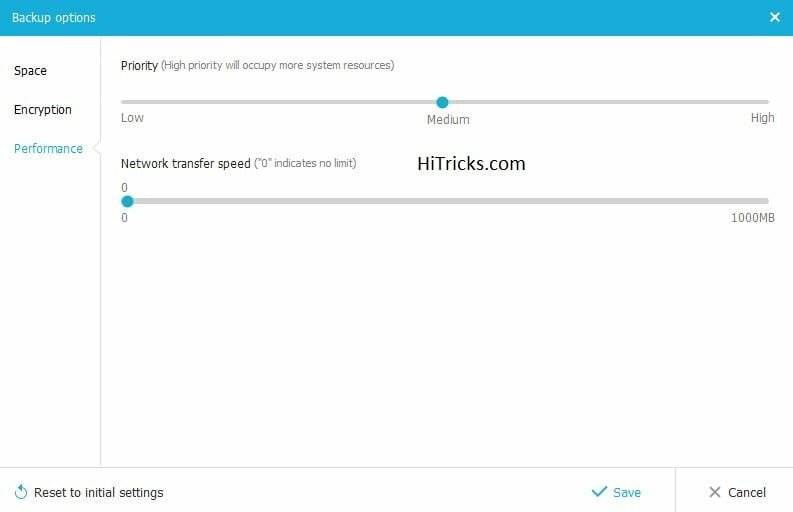 This feature allows you to set the time until backups will be kept. There are two types of options you can choose from. 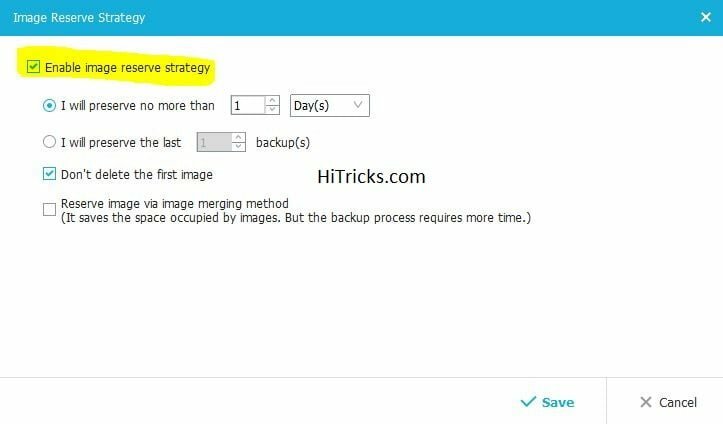 You can either set up the number of days the backup image will be kept before deleting. Or you can also choose the last ‘x’ number of images to keep. 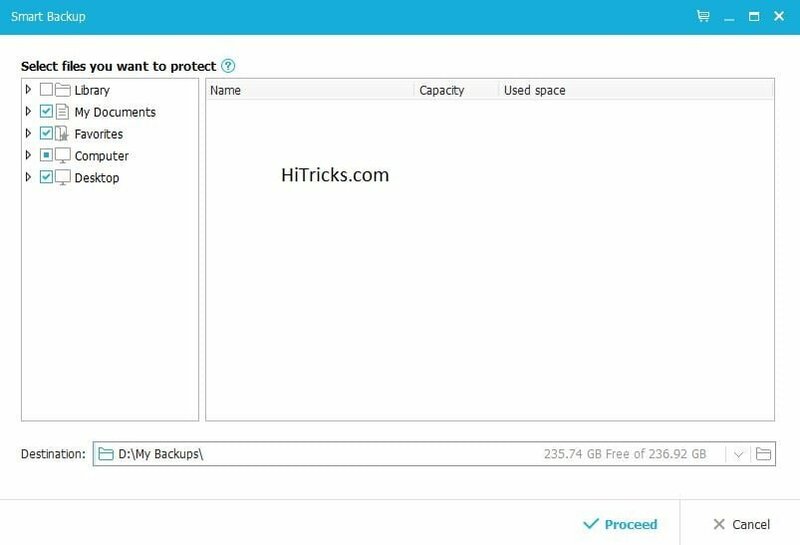 There is also an option to keep your first initial backup from being deleted. You can also check the Reserve Images via Image Merging Method. 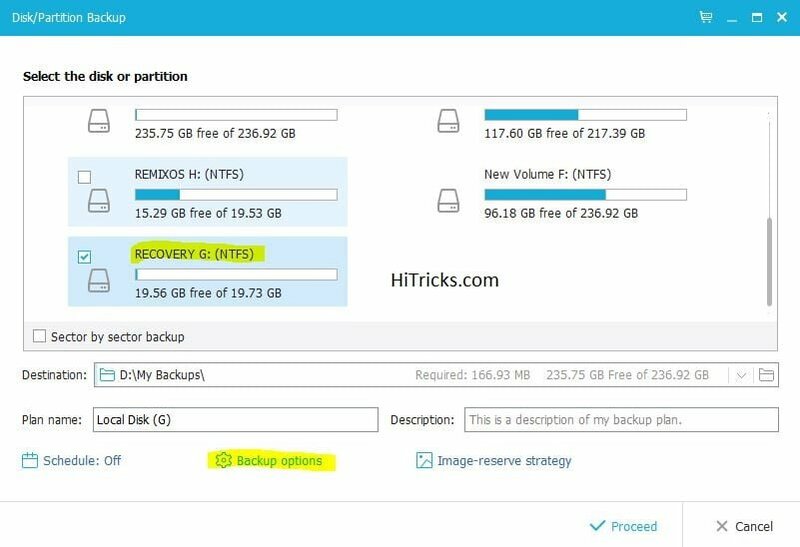 This method is useful for saving some space, but will take more time to backup. After you are done customizing your backups, click on Proceed. Now it will start it’s task. You can check the progress of your backup and the Estimated Remaining Time to Complete the Backup. After it finishes backing up, you can see the Backup Complete Dialog. 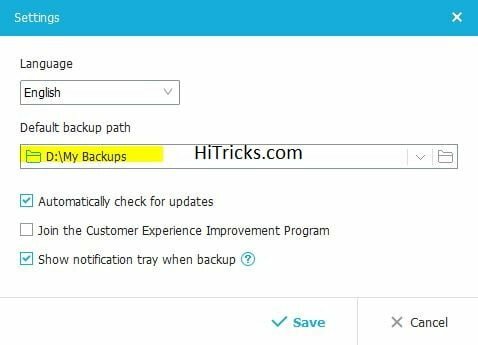 You can re-backup again or check out the Advanced Options that allows you to Edit or Delete your Backups. That’s all about Disk Backups. Try it out yourself. You can do it easily. 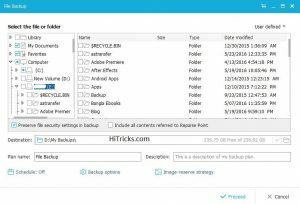 The file backup option is a very handy tool to backup individual files or folders rather than just backing up the whole drive. 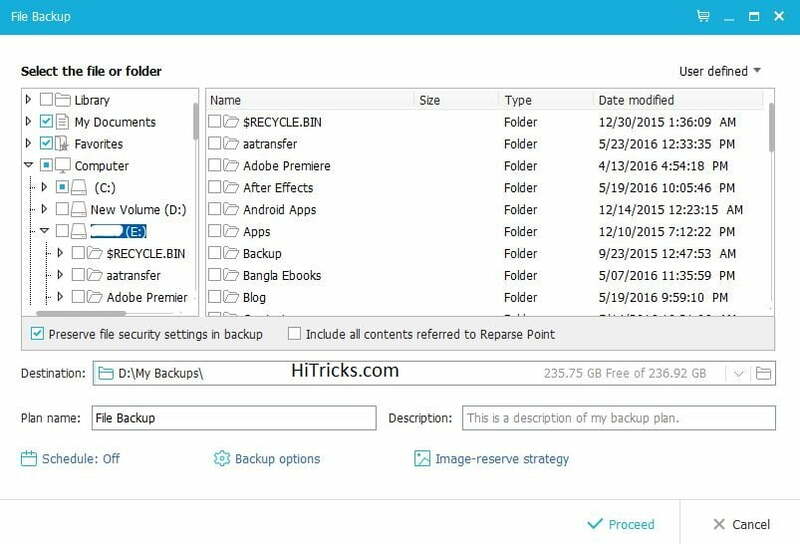 It is extremely useful if you want to do partial backups and not backup the unwanted data in your drive. To perform a File Backup, click on the File Backup option at the top. A dialog box will open where you can choose the files to be backed up and as well as the location. Here too, there are advanced configuration options available similar to the Disk Backup, which I discussed earlier. So I am not going to repeat the same thing here. After you are done, just click on Proceed, and you are ready to go. The System Backup option is probably the most valuable backup solution for backing up the entire Windows System. It is somewhat similar to the Nandroid Image Backups we perform in our Android Devices using CWM or TWRP. It will backup the system image of your C Drive containing all software data. 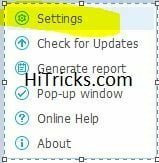 You can restore at a system restore point using the system backup feature. To start a System Backup, click on the System Backup Button. It will automatically choose the system and ask you to proceed. The other options are just similar to the previous backups which I discussed. The smart backup is an original backing up option inside the EaseUS Todo Backup Software. It detects the changes in the backed up files and backs up the changed components too. 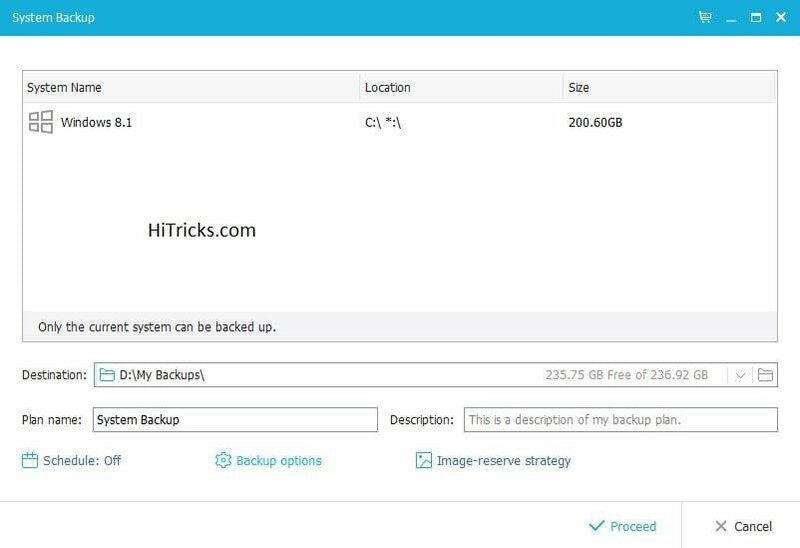 To start the Smart Backup, click on the Smart Backup Option. Again you shall see the dialog box asking you to choose the files to be backed up and the location to save them and click on Proceed. You shall notice that there are no advanced configuration options here. You just choose the files and proceed, and it will do it’s work automatically. 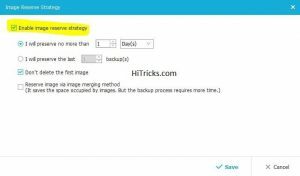 EaseUS Todo Backup also works as a Cloning Software for Windows. Like the name says, this option creates a clone of the whole hard disk. This is a handy option to clone your entire disk to somewhere. It is extremely useful to copy one system into another. To start the Disk Cloning, click on the Disk / Partition Clone Button. You will get a dialog box asking to choose the disk to back up. Select your desired drive and click Next. Now you will be asked to choose the destination disk. Choose it and click Proceed to begin the cloning. Make sure your target drive is empty. It is the location where the source disk will be completely cloned. 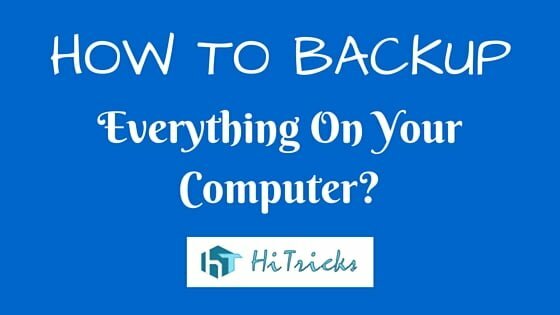 That’s all about How to Backup Everything on your computer using EaseUS Todo Backup. I hope this article has helped you in keeping your sensitive data safe. It’s time to share this article with your friends on social networks. 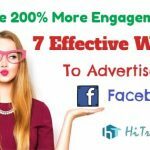 Use the Facebook Share Button to Instantly Share this with your Facebook Friends. Have queries? Want to appreciate? Use the Comment Box below to jot down your thoughts. I will be happy to respond you.